Britain’s Labour Party leader Jeremy Corbyn has been warned of a further wave of resignations after seven MPs quit the party over bullying, anti-Semitism and Brexit in the worst Labour split for nearly 40 years. Luciana Berger, Chuka Umunna, Chris Leslie, Angela Smith, Gavin Shuker, Ann Coffey and Mike Gapes all announced their resignations yesterday to form a new “Independent Group” in the Commons. The group were immediately labelled the “Gang of Seven”, after the “Gang of Four” who quit to form the movement that later became the Social Democratic Party in 1981, Labour’s last big schism. That divide was followed by 16 years of Conservative government. Tom Watson, Labour’s deputy leader, said the party could face more “days like this” as he directly challenged Mr Corbyn’s authority by saying that at times, he “no longer recognises” his own party following a takeover by the hard-left. He urged Mr Corbyn to reshuffle his front bench to help bring the party back into the “mainstream tradition” and said that he would develop alternative policies with backbenchers. Last night, another ghost of 1980s Labour rematerialised, as it emerged that Derek Hatton, the militant leader kicked out of the party 33 years ago, had been formally readmitted. The new Gang of Seven held a press conference in Westminster to lay out their reasons for resigning. Mr Leslie, who resigned as shadow chancellor after Mr Corbyn’s election as leader, said it would be “irresponsible” to allow the Opposition leader to become prime minister. Ms Berger accused Labour of being “institutionally” anti- Semitic and racist. Mr Gapes said Mr Corbyn posed a threat to national security, while Ms Smith said she no longer wanted to be “patronised by left-wing intellectuals who think being poor constitutes a state of grace”. All seven MPs criticised Labour for “facilitating” Brexit as they called for a second referendum. Mr Corbyn issued a short statement expressing his disappointment at their departures, while John McDonnell, the shadow chancellor, challenged them to do the “honourable thing” by resigning their seats and fighting by-elections. However, while the Labour leader attempted to sound conciliatory, the party’s youth wing branded the MPs “cowards and traitors” and Corbyn supporters online denounced the departing MPs as “Blairite Tory parasites” and claimed they “work for Israel”. Earlier, the seven MPs issued an appeal to politicians from both Labour and other parties to “leave the old tribal politics behind” and join their new grouping in the Commons as crunch votes on Brexit loom later this month. Jewish MP Ms Berger said she had become “embarrassed and ashamed to remain in the Labour Party” which, she had “come to the sickening conclusion, is institutionally anti- Semitic”. Former Commons foreign affairs committee chairman Mr Gapes said he was “sickened that the Labour Party is now a racist, anti-Semitic party” and “furious that the Labour leadership is complicit in facilitating Brexit”. Ex-shadow chancellor Chris Leslie said Labour had been “hijacked by the machine politics of the hard left”. At the launch in London’s County Hall, Mr Umunna issued an appeal to voters: “For far too long, political parties in Westminster – parties of which we have been a part – have been failing you. “If you are sick and tired of politics as usual, guess what? So are we. But the Independent Group’s launch was marred by a gaffe from Ms Smith, who apologised after appearing to describe black people as having a “funny” tint or tinge during a TV interview. “I am very sorry about any offence caused, and I am very upset that I misspoke so badly,” she said after her BBC Politics Live appearance. The Independent Group is due to hold its first formal meeting later this week. Tory Party chairman Brandon Lewis said the resignations confirmed that Labour had “changed irreversibly” under Mr Corbyn. 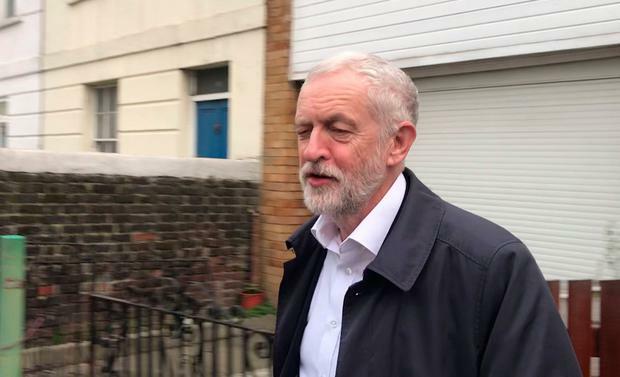 “Labour has become the Jeremy Corbyn Party – failing to take action on everything from tackling anti-Jewish racism to keeping our country safe,” he said. Unite union boss Len McCluskey hit out at the “splitters” who had “no stomach for a fight for Labour’s core values”. But Unison’s general secretary Dave Prentis said Labour had to “get its act together over Brexit” and “look long and hard at the reasons why the MPs feel they are no longer able to stay in the party”.